In order to provide you with a non-binding quote, we must know what type of furniture you would need to be assembled. 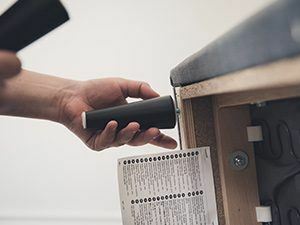 Furthermore, this will help us inform the technicians about any specific tools and supplies they might need to bring to complete more complex furniture fitting tasks (ex: secure a large wardrobe to the wall or install an entire kitchen). The flat pack assembly service is charged per hour and includes the labour and expertise of one or two furniture fitters, depending on the job extend. Our minimum charge is two hours (one assembler). Schedule your flat pack assembly service for a day and time that fits in with your lifestyle and household timetable. You can do this by calling us or by using any of the online options, provided on this website. If you agree to our prices and consider the quote affordable, a specialist will tell you how to move forward with the service. In addition, you may wish to combine the furniture assembly service with our furniture collection and delivery solutions and avoid the long waiting delivery times usually offered by most furniture retailers. With us, you will be able to use and appreciate your new furniture as early as the next day. Depending on your request, a single technician or a team of two will arrive at your property. All technicians are experienced, skilled, fully insured and fully equipped with all tools and spare parts as required for the specifics of the job. They will put together your pieces of furniture, following the furniture assembly instructions, and will install your furniture in the designated rooms. Your safety is of utmost importance to us, so large items (wardrobes, bookcases, filing cabinets) will be fitted and secured in place to walls with the appropriate brackets. The same applies to any other wall-mounted items and fixtures. Upon completion of the job, we recommend that you inspect the results and ensure that you are comfortable with how your furnishings have been fitted. Check whether they function properly (cupboard doors and drawers open and close correctly, items are steady and fasteners are tight). The professional furniture assemblers, are familiar with all flat-pack brands. They are very experienced in furniture assembly of IKEA flat packs but know how to put together any other furniture, made by Furniture 123, Harveys, Tesco, Homebase, Argos, B&Q, Aspace, Dwell and more. Be it for your home, your garden, your office, this service is convenient and easy to arrange. The technicians are comfortable working in any setting. Simply provide them with access to the area where you want your furniture to be situated and they'll handle the rest. Expect a speedy and affordable furniture assembly service. Keep in mind that we can purchase, deliver, and then assemble your new furniture. Simply go online, find out exactly what you need, provide us with your shopping list, and we'll take care of the rest. Soon you will enjoy your newly purchased flat-packs without even moving a finger! Of course, the technicians bring their own equipment so you have nothing to worry about. They have assembled so many flat packs already, they rarely need to look at the standard furniture assembly instructions. This guarantees a speedy and sturdy domestic furniture assembly service. Do you wish to receive a year-long, 10% discount on all our removal services and other home and business solutions? Then join our Fantastic Club. We also offer all our members preferential booking slots, and the ability to book their discounted services from everywhere by using our GoFantastic app. The expert fitters have the tools and experience to install various types of modular kitchens, from fitting worktops, wall-mounted cupboards and free-standing kitchen units to piecing together flat pack dining tables and chairs, coffee tables, bookcases, cabinets and shelves. They can also do an Ikea assembly service of various other odd pieces around the house, upon request. They will put together without any problem fitting such as shoe/clothes racks, bathroom vanity units or house plant stands. A wardrobe assembly or putting together pieces of furniture such as beds, bedside tables, chest of drawers and storage units will be done perfectly and securely with your safety in mind. The Fantastic pros will also fit any brand and type of children’s furniture, following closely the unique design’s instructions. From bunk beds, built-in beds with storage and other multi-purpose furniture to desks and chairs, the specialists will make your kids playroom a dream come true. 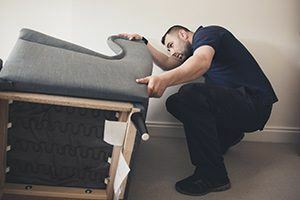 Do not worry if you need furniture assembly for Ikea flat packs, the professionals at Fantastic Removals assemble such furniture on a daily basis. Sprucing up your outdoor space with a new set of garden furniture? Then, let the local furniture assemblers get your pieces ready for immediate use and enjoyment at the first sign of clear skies. We can put together garden tables, chairs and benches, garden sheds, children’s playhouses and trampolines, as well as plant holding structures, such as complex trellises. Patio furniture assembly is also an easy job for our skilled furniture assembly experts. We can even help you assemble the IKEA’s newest outdoor addition - the unique spherical, vertical flat pack garden, designed to save you space if your city house comes with a small courtyard. Again, any type of office furnishings that come flat packed will pose no problem to the Fantastic flat pack assembly experts. Filing cabinets, computer desks and chairs, storage units, workstations, conference and office reception furniture, you name it, will be efficiently pieced together and fitted in the room and position you require. The technicians will follow your express instructions and complete the task to your utmost satisfaction. When the movers come at your address with the new furniture, they will have to assemble it there. Make sure you've decluttered the day before so there's enough space for the items to be assembled efficiently. Decide what you will do with the boxes after the assembly. With us, you can also schedule a waste removals service. A specialist will load, transport and throw away your rubbish at a nearby recycling centre. There isn't any adequate reason to spend money on old furniture. If it's too damaged, the most reasonable solutions is to sell it or toss. Often, its transportation disassembly and assembly costs close to buying a new one. If some of the items need to be attached to a wall, make sure to mention this to the operator on the phone. A handyman will arrive at your home with the whole equipment, required for the job. A: Yes. The company operates 7 days a week, including weekends and public holidays. Subject to availability, we can also arrange for your flat pack furniture assembly service to take place outside business hours on a work day during the week. A: Yes. Fantastic Removals London is a fully insured service provider. All the movers, packers and furniture fitters, we have partnered with, are also comprehensively insured against damages. Q: Can the technicians dismantle any old pieces of furniture? A: Absolutely. Just specify your individual requests in advance and we’ll handle the rest. Q: Do I need to provide any tools for the flat pack assembly service? A: No. The furniture fitters will bring everything they need for the job, including some spare parts, such as fasteners, cam locks, bolts, brackets, screws, etc. Q: Is it possible for them to take away furniture I don’t need anymore? A: Yes. You can combine your furniture assembly session with a furniture disposal service. Q: How can I change the date of my furniture assembly appointment? A: Please, contact the customer care team 24/7 in advance, preferably 48 hours prior to your booked appointment. The friendly advisor will schedule another more convenient slot for you. We Offer A Wide Range Of Services - Check Them Out! Get Your Furniture Assembly With Fantastic Removals Now!